This bright perennial flower is tougher than it looks; it blooms prolifically for many months, self-seeds, resists heat, requires little or no added water, and is surprisingly resistant to rabbits. 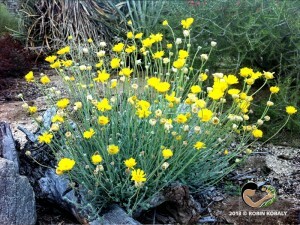 Desert Marigold is a cheery, fast-growing but short-lived perennial with bright yellow flowers from spring through fall. At lower elevations, this wildflower may bloom continuously, and can flower anytime in mild winters. Flowers are held on slender stems high above the white-wooly leaves on the lower half of the stems and in a basal rosette. This low, mounded plant can tolerate heat, cold, full or reflected sun, and drought–but not overwatering, which causes root rot. This plant brightens up borders, rock and cactus gardens, masonry walls, and any garden space with good drainage and no organic mulch. While it is short-lived, it does reseed easily (seeds are best gathered in fall and spread for planting). Desert Marigold requires no pampering other than removing old flower heads, but it loves a rock as a life partner.